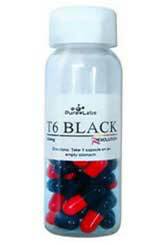 T6 Black Tube is a weight management supplement manufactured by Pure Labs. Very little is known about the company, but it maintains a mailing address in San Francisco and provides customer service via telephone, fax, and an online form on the company website. Supplements that bear the letter “T” followed by a number, such as T6, used to be associated with the thyroid—a gland that produces hormones that are necessary for an efficient metabolism. These days the presence of a letter “T” on the label of a dietary supplement is often nothing more than a marketing ploy, as is the case here. T6 Black Tube does not contain any ingredients that are known to be capable of stimulating production of thyroid hormones. According to the Pure Labs website, T6 Black Tube was created to be a new and improved version of a previous product, simply called T6 Black, which supposedly gave birth to “endless success stories”. We were unable to find any of these tales of triumph, but we did discover the old product and its predecessor share exactly the same formulation. Supersedes the originalT6 Black but identical apart from the label. There are 30 capsules per tube. In our opinion PhenQ is better product with a multiple benefit. N-Acetyl-L-Tyrosine (200 mg): An amino acid that is favoured by smart drug manufacturers due to its ability to boost alertness and fight mental fatigue. It is also believed capable of improving the mood and combating the symptoms of stress. As a nootropic ingredient it has a lot to offer. As weight loss aid it offers little, but it is feasible its presence may reduce the likelihood of comfort eating. Caffeine Anhydrous (200mg): Caffeine holds the distinction of being the most socially acceptable pick-me-up in the world. Its powers as an energy provider are undisputed and it also functions as a mild appetite suppressant and metabolism booster. The amount included here is similar to that provided by two cups of coffee. Naringin (50 mg): A flavonoid sourced from grapefruit. It is sometimes credited with fat burning abilities, but such claims are far from being proven. It is known to interact well with caffeine though, and can boost its stimulatory effects. However, naringin can produce less favourable reactions if it is used in combination with certain medications. Phenethylamine (50mg): A compound that is believed capable of boosting the production of certain brain chemicals—namely serotonin and dopamine. In theory this should lead to an improvement in the mood, but Phenethylamine is related to amphetamine and can be similarly addictive. Pure Labs also make claims for the ingredient’s potential as a fat burner, but Phenethylamine has never been satisfactorily proven to possess such abilities. White Willow Extract (25mg): A tree bark extract that provides the chemical salicin. It is often utilized as a fat burning ingredient, but there are no grounds to support its use in this way and its use can entail nasty side effects. Dendrobium Nobile Extract (25mg): An orchid derivative that is used as a performance enhancer. It may also be useful as an energy provider, but many medical experts feel the ways it may interact with the body (good and bad) require significantly more study. How to Take T6 Black Tube – One capsule is required once or twice a day and should always be taken on an empty stomach. No customer feedback is available for T6 Black Tube, but Pure Labs use Amazon to market another product, called T6 Black Revolution, and it contains the same ingredients in identical ratios. That being the case the two products should perform in a similar manner. Amazon customer reviews suggest the product may work for some users, but not for others. So although some people state it is “brilliant for weight loss” others claim the pills are “rubbish”. No information is provided about the possible side effects or health considerations use of the product entails, but side effects appear to be an issue for some people so we advise all potential users to refrain from using T6 Black Tube diet pills unless they have attained the approval of their GP. T6 Black Tube is sold without a money back guarantee. A 30-capsule “tube” of T6 Black Tube costs £14.99 from the Factory Supplements online store. It is not available from the manufacturer’s website, but the site does contain yet another rebranded version of the product, called T6 Black Revolution, that uses the exact same formulation to make the old formulation “even better”. Customers who hit the “Buy Now” button are transferred to the relevant sales page at the Factory supplements online store. Each bottle of T6 Black Revolution contains 90 capsules and has a price tag of £33.99.